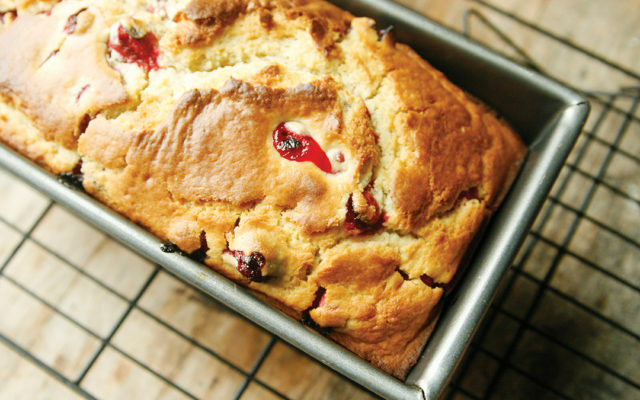 A perfectly festive recipe for cranberry quick bread. It might be said that one of the first signs of fall is the presence of fresh, scarlet, tart cranberries in bags at the grocery store. Although they are available dried, frozen and in sauce form year-round, the fresh berries only make their appearances from late September to December or January. Cranberries grow on low, trailing vines in bogs with sandy, acidic soil. Many cranberries are wet harvested meaning the bogs are flooded at harvest time, dislodging the berries from the vine. They float, so it’s a matter of scooping them off the surface of the water. But I was surprised to learn a few years ago that some growers here in Maine dry harvest the berries, a lesser used process that results in fruit that lasts longer. Machines, these days, help the process along with human assistance. I wonder what folks 400 years ago would think of that? According to “The Story of Food,” published by DK, in the 17th century, indigenous people introduced English settlers to cranberries and they were so impressed that they shipped some back to the King of England. With a natural preserve that stopped the berries from going bad, they were also packed on small ships for eating, dried and carried by Lewis and Clark on their journey and so on. Today, they are a holiday tradition. Cranberry sauce is served alongside (hopefully) juicy slices of turkey at Thanksgiving, and the berries are transformed into something sparkly to decorate desserts at Christmas and New Years. But we shouldn’t limit our cranberry consumption to those times. A good source of vitamin C and potassium, raw cranberries are also lovely in baked goods like this Cranberry Quick Bread. Pour the batter into the prepared loaf pan. Tap gently to even out. Bake for 50 to 60 minutes, until golden brown. A butter knife inserted into the center of the pan should come out cleanly. Place the pan on a cooling rack and allow the loaf to cool in the pan for 20 minutes before inverting to release. (You may want to run a knife around the edges first to ensure an easy release.) Cool completely before slicing.